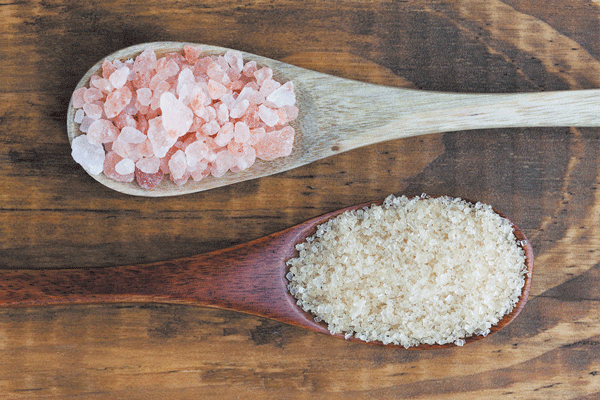 Most Americans consume much more than the recommended levels of sugar and salt. However, you can retrain your palate to be satisfied with less of both. If you own a sugar bowl and a saltshaker, you may be wondering if you should ever fill them again. The panelists crafting the 2015–2020 Dietary Guidelines for Americans emphasized that we're consuming much more sugar and salt than is healthy for us and have advised us to pare our intakes of both considerably. That said, they have acknowledged that the sugar bowl and saltshaker aren't the principal villains at the dining table. About 80% of the sugar and salt we eat is added to packaged and commercially prepared foods. Sugar, in the form of glucose, supplies the body with energy. However, we don't need to eat any sugar, because our bodies can convert carbohydrates—and even fat and protein, if necessary—to glucose. Although fruits, vegetables, and dairy naturally contain some sugars, those sugars are "packaged" with vitamins, minerals, and fiber and are released slowly into the blood. The phrase "added sugars" was adopted by the USDA in 2000 to distinguish sugars put in during processing, in preparation, and at the table. Added sugars insert "empty calories" into a food or beverage because they aren't associated with any other nutrients.